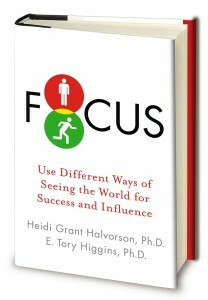 On the cover of Focus: Use Different Ways of Seeing the World for Success and Influence are a red light and a green light. The symbols nicely capture the central idea in this fascinating book (Buy it on Amazon, BN, 800CeoRead, or IndieBound), which debuts today. Heidi Grant Halvorson and E. Tory Higgins, who together run the Motivation Science Center at Columbia Business School, argue that human beings have two broad approaches to the world. Some of us are red lights. We’re prevention-focused. Our overriding goals are to minimize losses, to feel secure, and to elude the looming possibility of failure. Some of us, meanwhile, are green lights. We’re promotion-focused. Our overriding goals are to maximize gains, to feel nurtured, and to take chances even if it means making big mistakes. Because I know Pink Blog readers love the sort of actionable social science found in this book, I figured out Heidi Halvorson’s and Higgins’s approaches (they’re both promotion-focused) and convinced them they had a lot to gain from answering some questions. 1. To what extent is being promotion-focused or prevention-focused innate? That is, are we born one way or the other? Do we ever change over time? We aren’t born with a dominant focus, and we all use both promotion and prevention focus at least some of the time depending on the circumstances. But our upbringing at home and the culture surrounding us can make us more promotion or prevention-focused. How were you raised? When you did something wrong, did your parents punish you with extra chores (prevention) or withdraw their attention and affection (promotion)? What culture do you live in? Americans grow up in a society that praises individual accomplishments and loves innovators, making us more promotion-focused (on average) than societies that emphasizes rule-following and self-sacrifice. 2. One of the big ideas in the book is the concept of “motivational fit.” Could you explain what it is and why it matters? Motivational fit happens when your experience – the way you are working, the kind of task you are working on, or the feedback you receive – sustains or enhances your motivation. Promotion motivation feels like eagerness, a desire to really go for it. Being optimistic, working quickly and creatively, making choices based on the pros of each option, and being offered incentives framed in terms of potential gains all provide a motivational fit for someone who is promotion-focused. Prevention motivation, on the other hand, feels like vigilance – being careful and on the look-out for problems. Being a realist (or even a skeptic), working slowly and accurately, making choices based on the cons of each option, and being offered the incentive to avoid losses, all create fit for prevention. The benefits of motivational fit, not only for individuals’ performance and success but also for influencing others (as parents, managers, coaches, etc. ), are really remarkable. Studies show that people value what they are doing (or what you are selling) more, find feedback more believable and persuasive, and are more engaged and effective when they experience fit. 3. Does that mean that on the job managers should give prevention-minded employees and promotion-minded employees different types of feedback? Absolutely. Promotion-focused people thrive on optimism, so it’s really important to keep them feeling positive even when you are delivering bad news. They need to learn from their mistakes, but not dwell on them for too long. They also respond well to praise, and work best when they feel that they are making real progress toward their goal. Prevention-focused people, on the other hand, aren’t optimists. (At least, the successful ones aren’t.) They are what psychologists call “defensive pessimists.” It’s not that they believe they will fail – that’s just plain pessimism, and that doesn’t work for anyone. It’s that they believe they might fail, if they don’t work hard and take the necessary steps to keep from getting derailed. This kind of thinking keeps them vigilant, and keeps their motivational machine humming. Prevention-focused people are often visibly uncomfortable with too much optimism or praise – on an often unconscious level, they realize that having a sunny outlook would make them lower their guard, and that their work would suffer as a result. So avoid effusive praise with the prevention-focused – instead, give them honest, realistic feedback about how they might improve. 4. You’ve got a whole chapter on parenting. But give us a preview. Should parents be promotion-focused? Prevention-focused? Neither? Both? This is a great question, because it speaks to the whole “which is better?” issue that comes up all the time, not only for parenting but for work and life in general. We know from nearly two decades of research now that people can live successful, satisfying lives with either dominant focus. They will have different strengths – and different weaknesses – but overall, one way of living and working isn’t “better” than the other. That said, there is good reason to believe, especially from research on teamwork, that promotion and prevention can work together well and having strengths in both is desirable – because ultimately, we all want to be able to advance and achieve while also staying safe and secure. Otherwise, you may find that you live a life of adventure but never remember to pay your bills and floss, or that you have perfect credit and teeth, but never seem to have any fun. So as a parent, your best bet is to use both promotion and prevention-focused ways of reinforcing and discouraging behavior to some extent. But just as important, you want to teach your children when it’s best to be promotion-focused (it’s time to be open and creative) or prevention-focused (it’s time to be careful and analytical), and how to work with that focus to reach their goals. 5. We’ve been talking a lot about selling around here recently. Can you give an example of how you might sell the same product differently to a prevention-focused prospect versus a promotion-focused one? The second half of the book is devoted to describing ways of creating motivational fit in order to – as you might say – move people. The gist is that you want to pitch your product or idea in terms of gains, advancements, and rewards to a promotion audience, but pitch it in terms of losses avoided, safety, and reliability for a prevention audience. If you are selling toothpaste, for instance, you want to emphasize the white teeth and beautiful smile for promotion, and the anti-cavity protection for prevention. I disagree with the opening premise that people aren’t born red lights or green. It appears that they are. I’ve seen twins that I would consider one a red and the other green. It is common in siblings that one is red and one is green. I believe that genes/chemical make-up/DNA whatever you call it is a much larger determinant of who we are than social scientist give credit. We may have the ability to vary the glow of a light within a range, but we are one, or the other, nevertheless. Regarding #5, are there indicators that quickly signal whether the person you are trying to move is a promotion person or a prevention person? I like the distinction between eagerness and vigilance as felt experiences of the green light and red light. Good green lighters recognize the virtues of caution and prudence, and good red lighters recognize the virtues of boldness and risk. On the level of personal experience its helpful to be aware of switching modes and noticing when the red light might appear to always be red (or vice versa). Interesting. Hey there! Someone in my Facebook group shared this site with us so I came to look it over. I’m definitely enjoying the information. I’m bookmarking and will be tweeting this to my followers! Outstanding blog and terrific design.